We were surprised to discover that the noise was caused by people carving gravestones. 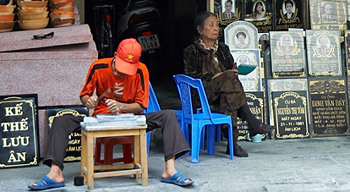 They carve each one by hand, and it is just our luck that our hotel is on a street full of gravestone vendors. We would soon learn, after wandering around for the day, that many streets in Hanoi are like this; there are multiple vendors of the same type right next to each other, often selling exactly the same stuff (some of the streets are even named after the type of vendor, e.g. Pho Hang Bac = Jewerly Street and Pho Hang Bun = Vermicelli Street - yum!). In some ways, this is very convenient since, as long as you know where the kitchenwares street is, you can do all your comparison shopping very quickly. But heaven forbid you want to buy anything else while you’re on the kitchen wares street… no dice. We found the shoe street, the metal works street, the Buddha statue street, the musical instruments street, the decorations for wedding celebrations street etc. With the exception of the metal works street, any of these would have been better places for a hotel. Our situation was further exacerbated by the confusing fact that at least a few of the gravestone tappers seemed to work all night. There was a brief respite in late morning, but other than that, it basically never stopped.